Each of the smaller ships have the most CPU intensive weapons (rapid fire auto-cannons) to fire at the indestructible capital ship all at once. This was to test that the game will handle the large number of objects and sound effects. There are no simplified calculations in the game for battles that you are not currently viewing (apart from rendering optimizations). All AI, ships, collision detection, projectiles and missiles are always fully simulated. I expect the ship count could be significantly higher for normal game-play as there wont be battles happening all at exactly the same time like in this video. In a typical game you will most likely have the majority of ships transporting cargo, mining or patrolling. Those kind of tasks don't require much processing power at all. The frame-rate displayed in the video would normally have been much higher but the recording software was limiting it quite badly. Running the same test scenario without recording I averaged around 50 FPS. I recently switched the audio library that Galaxial uses over to irrKlang as I was having problems with OpenAL drivers and sound crackling. Overall I'm really pleased with irrKlang's performance and ease of use. In the video there are often over 300 sound effects playing at once! Each individual projectile from the auto-cannon weapons have their own firing and impact sound effect. Ships also have engine rumbling sounds which sound great when there's not much going on. A lot of the sound effects I'm using at the moment are just placeholders, but I am planning to get professional effects made by a sound designer when the game is almost feature complete. 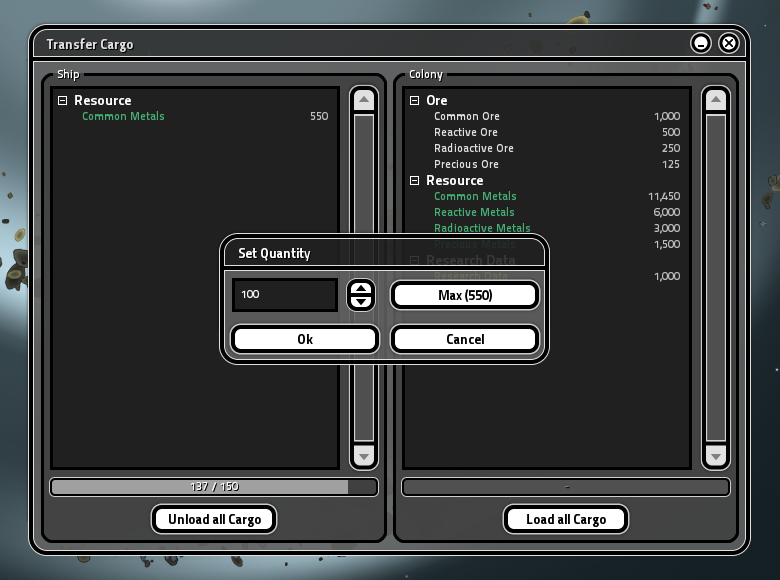 The drag and drop user interface for manually transferring cargo between docked ships and colonies has been finished. Holding shift while dragging items will let you set the amount to transfer. The Load/Unload buttons at the bottom will attempt move all items from one cargo hold to the other, so long as there is available space in the ship. Colonies will have unlimited storage space. Amazing update! Great to see some battle footage again. I thin you are achieving a clean layout and a solid game. Also, the heavier ships (combined slower motion and sturdiness) seems to make them feel larger and heavier indeed. A lot of work has to be done to achieve such things, those details that reveal a careful tuning behind the scenes. Amazing fluidity! Beautiful game as always. Keep at it, it looks very near completion. Hey love what you've done so far. Will you be able to manually pilot a ship? Any more info like? Will ships be basically build hundreds and throw away or more focus on keeping them alive? 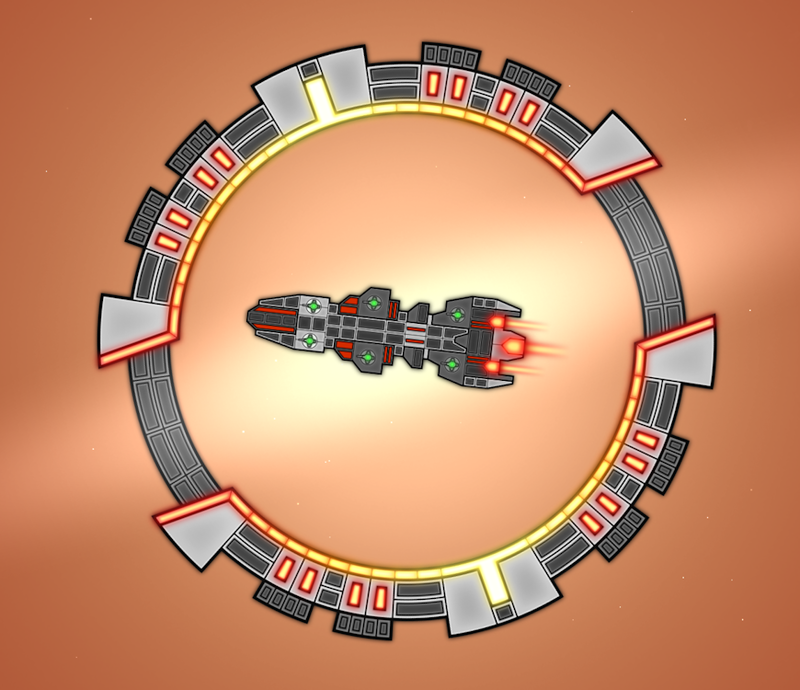 I am not the biggest fan of the art style for the ships, but it is original looking! Yes, you can manually pilot any of your ships. There will be lots of specialist support ship classes and modules, so the aim will definitely be to try and keep them alive, rather than 'throw away'. Just a small question the art design looks pretty simple and I just love the way ships look. Do you plan on letting us design the look of our ships or will they all be Prebuilt? Loving the way the game is coming along! The ships will all be pre-built. To make new ones you will need to create the textures in a graphics program such as Illustrator or Photoshop. There wont be a ship editor in the game. The game has modding support, so should be fairly easy to add or change. I've been following your blog from a long time now and wishing that I could play this game. Seeing this video makes me realize that, after all this time, that day may finally be close at hand. I cannot wait! Keep up the fantastic work! Hi. Yes, its still very much alive. Been making steady progress but have have had a few distractions and been ill the past few weeks, so the next development log is a bit delayed unfortunately. Hi, your game look awesome. Why don't you add it on Steam Greenlight? Could get greenlighted in one month and make your game more visible. I plan to put Galaxial on Steam Greenlight once it is closer to release, as I will then have more time to dedicate for promotion and getting votes.